We are immensely proud of our vineyard and we tend to it with a diligence second to none. We crop and yield low on vines with moderate vigour. 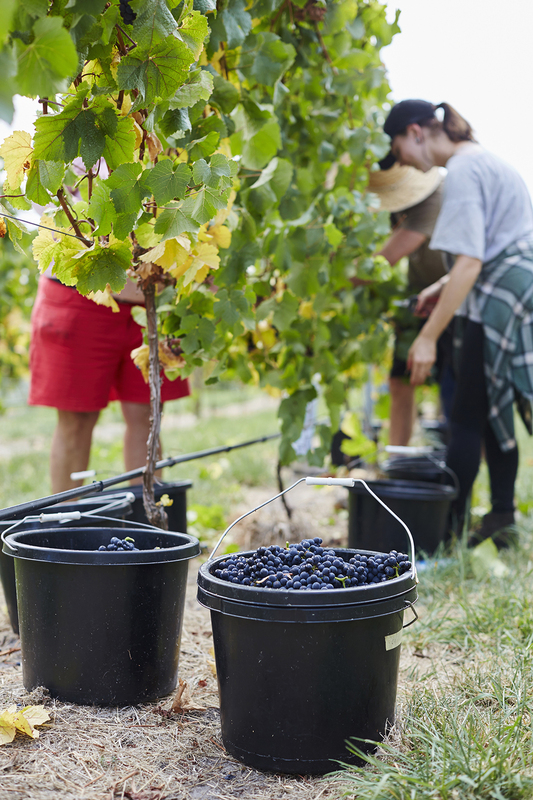 For all of us here at Moore's Hill Estate, viticulture is at the heart of what we do. Well-tended, healthy vines will always make the best wines. Our viticultural practices involve preventative management of common vineyard diseases and pests with the bare minimum of chemical intervention and every year we use less and less nasties. Sited on a north-east facing hillside, the vineyard takes advantage of sun and cooling maritime breezes. The sandy loamy soil drains well. The site is not prone to frost and has never experienced crop loss due to frost. The vineyard is laid out in a N/S row orientation with vines spaced at 1.5m apart with 2.5m between rows. Extensive experimental work has been done in the vineyard to determine the best training system to adopt for our particular situation including Scott Henry, spur pruning and Vertical Shoot Positioning (VSP) allowing us to confidently settle on VSP. Similarly, in order to keep yields low and maximise high quality we have moved to cane pruning to two canes per vine which we are confident will help us raise the quality bar even higher. Clonal selection has also been an important factor in terms of fine tuning our viticultural practices for our specific climatic and soil conditions. We have a number of Pinot clones which gives us plenty of room to work with when making our wines. Currently we have 1.0ha of Pinot Noir, 1.0ha of Chardonnay, 0.5ha of Cabernet Sauvignon, 0.5ha of Merlot and 1.5ha of Riesling. In Summer 2015, we planted an additional 2 hectares of vines- Pinot Noir, Chardonnay and Pinot Gris. The vineyard is fully irrigated by a dam and a bore but we only need to irrigate in an exceptionally dry summer. In February, the vineyard is covered entirely in nets to protect the precious fruit from the birds. Starlings and black birds do the most damage. We usually commence our harvest in March, starting with Chardonnay for sparkling. 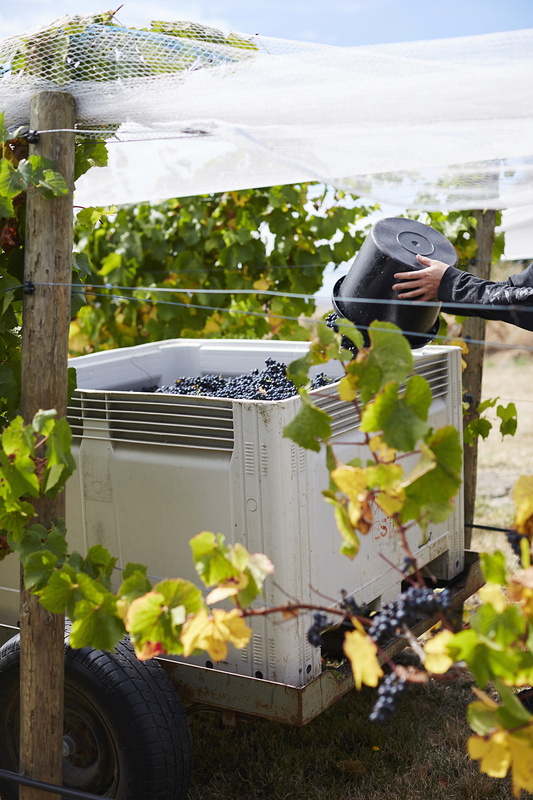 We pick entirely by hand ensuring top-notch quality and gentle handling of the fruit. Most of the picking is done in April, finishing in early May with our later ripening varieties, Cab Sauvignon and Merlot. We employ a team of seasoned locals and afew backpackers for this brief but important period. The construction of our on-site solar powered winery in 2017 not only shortens the distance between vine and wine to aid wine quality, it gives us the flexibility to pick in small batches, to experiment and to be in control the process from beginning to end.